At its best the Wrinkled Peach is a strong contender for the title 'Most Beautiful British Mushroom'. Until the major outbreak of Dutch elm disease in the second half of the 20th century, this was a rare mushroom, but then for a decade or two its food source, rotting elm wood, became commonplace and the Rhodotus palmatus population mushroomed. (Sorry!) 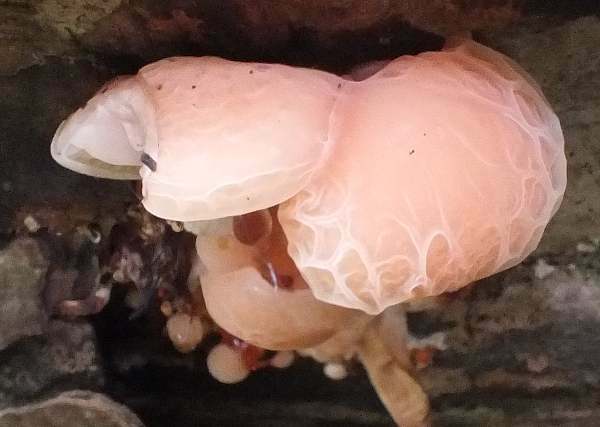 Now there are far fewer elm trees in Britain and Europe, and the beautiful Rhodotus palmatus is becoming an even rarer sight that is was 100 years ago. Rhodotus palmatus is also found in several countries of northern and central mainland Europe including the Scandinavian countries as well as Germany, Poland and Italy. 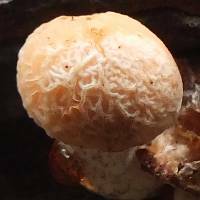 This remarkable mushroom is also reported from parts of Asia and North America. The Wrinkled Peach was described in 1785 by French naturalist Jean Baptiste Francois (Pierre) Bulliard, who named it Agaricus palmatus. It was another Frenchman, mycologist René Charles Joseph Ernest Maire (1878 - 1949), who transferred this species to a new genus Rhodotus, which he created in 1926 to accommodate this unique mushroom, whereupon the currently-accepted scientific name Rhodotus palmatus was established. 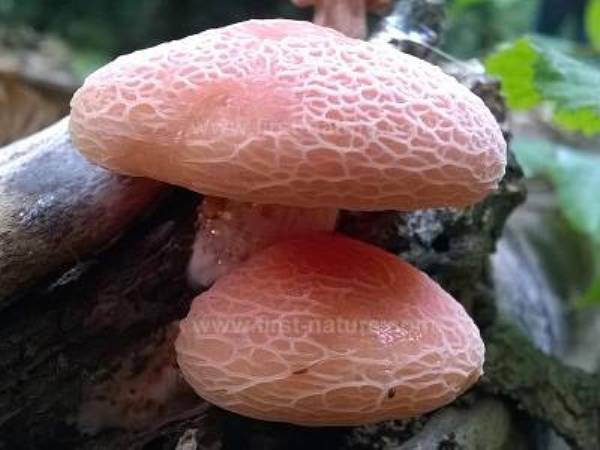 Not surprinsingly for such a beautiful mushroom, the list of synonyms of Rhodotus palmatus is quite substantial and includes Agaricus palmatus Bull., Pleurotus palmatus (Bull.) Gray, Agaricus subpalmatus Fr., Crepidotus palmatus (Bull.) Gillet, Pleurotus subpalmatus (Fr.) Gillet, Entoloma cookei Richon, Pleurotus palmatus Bull.) Quél., and Agaricus phlebophorus var. reticulatus Cooke. Rhodotus palmatus is the type species of the (monotypic, meaning that there is only one known species) genus Rhodotus. The specific epithet palmatus is a reference to the wrinkles on the cap surface, which resemble (somewhat) the lines on the palm of a hand. 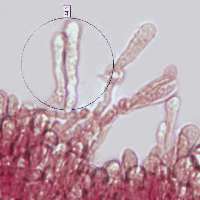 Initially almost globose then convex with an inrolled margin and eventually almost flattening; pink when very young, becoming peach coloured. The tough cap skin (pellicle), which can be peeled completely, is thick and gelatinous and usually wrinkled in the form of a network of interconnected ridges. When fully developed caps range from 5 to 10cm across. The cap flesh is white. The adnate to free gills are pinkish and moderately spaced. 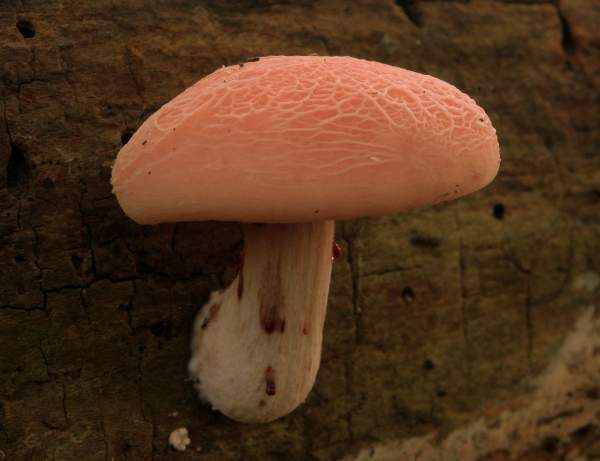 Pinkish but paler than the cap, the stem of this mushroom is 3 to 7cm long and 1 to 1.5cm in diameter, without a stem ring, and is covered in whitish fibrils. 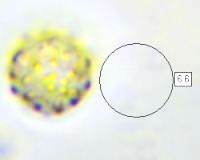 30–70 x 10–15mm, white to pinkish, covered in white fibrils; often bleeding red or orange droplets. 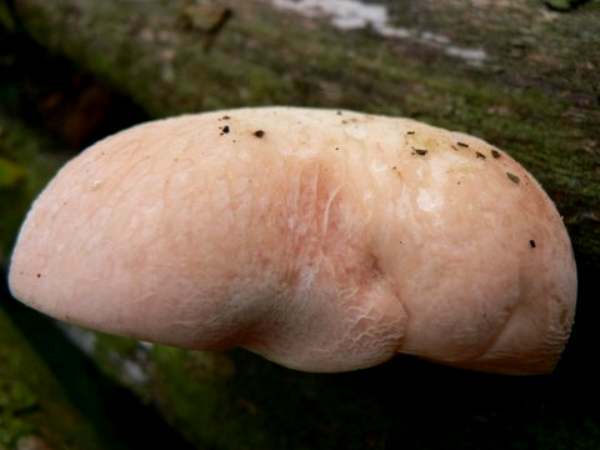 The stem flesh is whitish tinged pink to orange. Because of its growing habit, stems of this mushroom are Invariably curved. 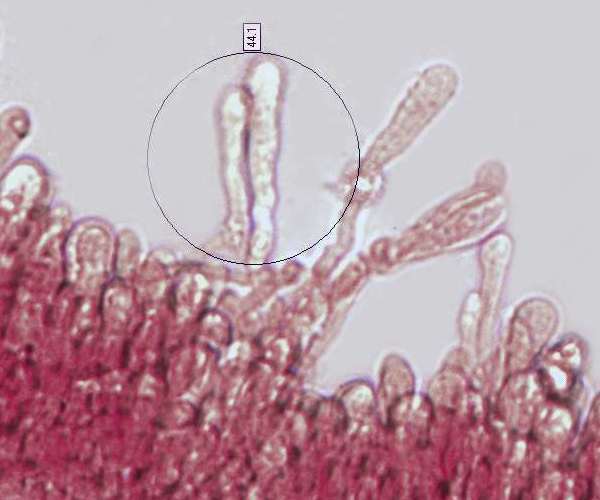 Mostly fusiform or narrowly club-shaped; typically 8 x 40µm. 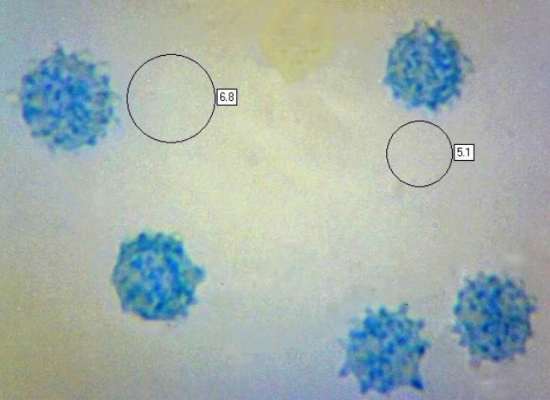 Globose, covered in fine warts, 5-7µm in diameter; inamyloid. Saprobic on well-rotted hardwood trunks and branches, usually of fallen elms but occasionally on other broadleaf timber. This is the only Rhodotus species; it is difficult to mistake it for any other mushroom. 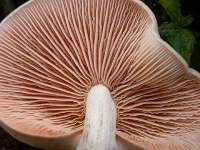 The Wrinkled Peach Rhodotus palmatus is generally considered to be an inedible mushroom. This page includes pictures kindly contributed by Simon Harding, Richard Haynes, Ian Rowing and Stuart James Wilson.